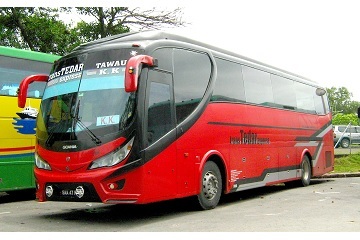 Kota Kinabalu-based bus operator TransTedar Express have been providing services for people throughout the state of Sabah since it was established in the year 2005. It has since become a household name when it comes to bus services within Sabah because of how convenient the different routes made available for everyone to use. It has become even more practical since you can get your TransTedar Express bus ticket online now through Easybook’s easy-to-navigate website. Now anyone can explore the second largest state in Malaysia without having to go through any fuss. The company slogan for TransTedar Express in Malay reads as “Selamat, Selesa & Santai” which translates as “Safe, Comfortable & Relaxing.” In order to bring this slogan to life, the bus operator prides themselves to take care of their passengers because they are the reason the company is still on the roll until today. 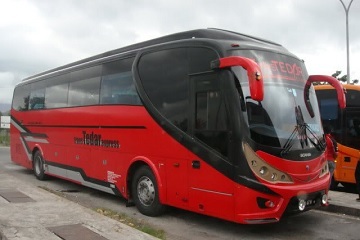 TransTedar Express will make sure the passengers are satisfied with their services at all bases to maintain their loyalty factor as it is certainly an important element to apply onto any type of business. Safe- Staff members and drivers at TransTedar Express are required to undergo professional trainings that are made available by the company in order to deliver the best services to their existing and new customers. This has allowed the customers to form a trust with the operator to continuously purchase bus tickets from them without going through any of the hassles while travelling. Comfortable- They make sure that the bus seats are assured to put you at ease no matter the distance or destination you are heading to. With long journeys, these basic necessities go a long way to allow yourself to have a pleasant trip. Relaxing- Stay breezy with the air-conditioning systems built on each TransTedar Express bus. You can also watch a film on the bus as there is a television available on the coaches to keep you company and entertained. The other reason for you to feel relaxed is the fact that charging ports have been installed on each TransTedar Expressbus so do not have to worry about getting low battery on your smartphones, tablets or laptops before even arriving at your drop-off point. Whether you are planning to check out Kota Kinabalu – more commonly known as “KK”– for its population of orangutans or camp out at the beautiful Tawau Hills National Park in Tawau, there is no denying the fact that you are in for a great adventure in Sabah. TransTedar Express routes also include Lahad Datu, Keningau, Kundasang, Ranau and Bukit Garam, just to name a few. The most popular buses are those that are going from KK to Lahad Datu, Keningau, Kundasang and Ranau. Time to put on your exploration cap and plan your next holiday whether it is in KK or Tawau with TransTedar Express to create some new memories. Forget about queuing up for your bus tickets. Save yourself more time to get it from Easybook at the comfort of your home. Booking a bus ticket with TransTedar Express through our website and smartphone application available for both iOS or android is as easy as ABC.